Set in the midst of the old city of London, The Trading House in Bank invited Idle HQ down to try out their extensive, elaborate cocktail and food menu. Read on to find out how we got on! Housed in the old Bank of New Zealand, The Trading House in Bank is a hidden gem tucked away in one of the capital's oldest districts on the east end of Gresham Street. Set in a striking limestone exterior, the interiors will take you back in time to the Victorian era with a lavish decor throughout including; a striking full-length bar running the length of the building, a wrought iron mezzanine level and opulent features throughout. With such plush interiors, our expectations for the food were quite high - needless to say, we weren't disappointed. On entering the Trading House, you immediately get the feeling that you aren't about to have a simply 'adequate' Weatherspoon-esque experience. The place is buzzing with the cities' financial workers, creatives and tourists alike, not to mention the welcome addition of live music at 9pm. With an impressively vast drinks list of wines, beers, ales and ciders to lure you in, the Trading House hit the right mark from the outset, however, it's the cocktails that really shine. The expected list of classics are on offer, from mojitos to cosmopolitans, but it's their unique house cocktails that really set's the establishments cocktail menu apart. Cardamom Old Fashioned, Lemon & Anise Sour and Cherry Fennel Sling we're among some of the best, offering a welcome alternative to the normal lineup. Regardless of your preference, the bar team are trained in the world’s top 100 cocktails, so drinkers can be assured of their favourite tipple. Coming to the food, the mood can be best described as freshly cooked pub grub, done simply and well. The vast menu contains elements of deli, rotisserie and barbeque styles of cooking, firm home favourites and generally all around comfort eating staples. For those who fancy a lighter eat, there's also a range of healthy cold plates, salads and snacks as well as sharing plates for a few nibbles among friends. Having tried a range of products, from the healthy superfood salad with a side of sweet potato fries to the indulgent steak and stout pie; everything put in front of us did exactly what it said on the tin - and more. There's no sign of pretentious natured 'foams' or 'deconstructed plates' here, just simple, honest, straightforward good-tasting food - which in the city, is a refreshing breeze among the currently cluttered cosmo-cuisine scene. As the night went on and the live music began to really kick off, the mood changed to a more relaxed, dance bar vibe. The city suit brigade pulled off their ties, the ladies whipped out the flats and the atmosphere in the bar changed from sophisticated lounge-bar-eatery to a hopping live music venue with dancing and a great time being had by everyone. Typically speaking, there's a wide mixture of folk to be found at the Trading House so there's no typical dress code. At peak time, however, there's an abundance of banking city folk so if you're not one to stand out from the crowd its best to keep things relatively smart. 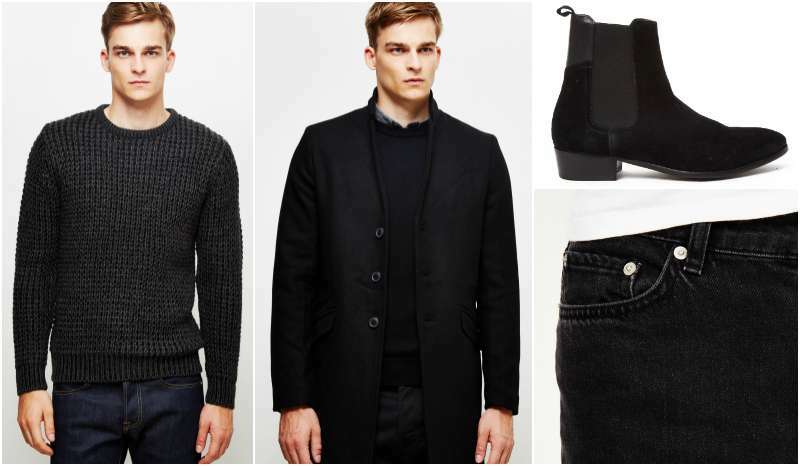 Mixing a knitted sweater with some jeans and smart Chelsea boots is a smart-casual getup that'll fit perfectly in with the other guys while adding your own sartorial flair. Top off the look with a simple trench coat and you're all set! That's your lot! With all the aforementioned qualities that The Trading House possesses, you'd probably expect a substantially high price tag to match. In actual fact, the price is very very reasonable allowing you to really treat your self to a slap up meal (or three courses, as we did). Even better news, the Trading House will be offering 40% OFF ALL FOOD for the month of September 2016 so you can really treat yourself! Trust us, you won't be disappointed. The Trading House opens Monday-Wednesday 12pm-12am, Thursday 12pm-1am and Friday 12pm-2am with weekends available for private hire only. Keep up with the latest from The Trading House on their Website | Twitter | Facebook or reserve by calling 020 7600 5050.